If you travel to Big Talbot Island State Park on Amelia Island you can walk along this beach littered with fallen trees that have been bleached white by the sun. 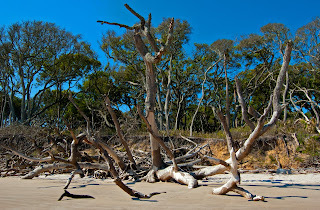 The live oaks and a variety of other trees on the bluffs are generally twisted and wind blown but they make a living backdrop for the skeletons. You can also find Ospreys and other birds along this stretch of beach. I was there in the early morning and was unable to get any good shots using the water as a background due to the strong backlighting. It's an excuse to go back in the afternoon or better yet on an overcast day. If you are interested in collecting driftwood then you need to go elsewhere, it's strictly forbidden here and rightfully so.